Ellie is a self described conspiracy theory enthusiast. 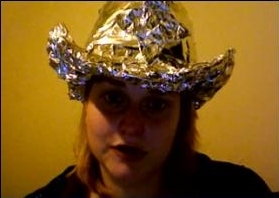 She currently resides in California and has just returned from a trip to her "Mecca": Roswell, New Mexico. Apparently, she is the one that Vlad/Hans/Kosmopol has been leaking classified information to and she posted it on her now defunct website. She has a new website now, containing a video blog and some other "out of this world" information. Of note is a few of her advertisers, one being Kantsaywhere Institute and the other being an advertisement for whale meat, linking to a website with Nisshin Maru related info.